Here’s my situation: I’m usually pretty good at remembering to take along my Sigg thermos when I want a latte from my local coffee shop. But sometimes I leave in a rush and forget it, or I’m out running errands and don’t have it on me. The back-up solution? My Cup Kozy. The Cup Kozy is a reusable felt coffee sleeve that you can use instead of those cardboard ones that the coffee shops offer. They dress up your cup, and keep your hands from getting toasty. Cup Kozy has added features that really make this little product convienent. 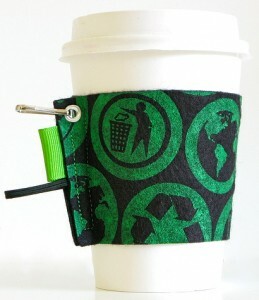 And if you think something as small as a reusable coffee sleeve can’t have features, well hang onto your hats. 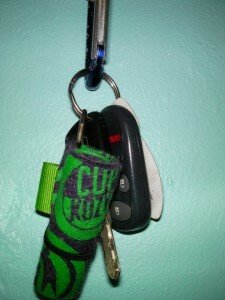 Cool Feature #2: It Hangs On Your Keychain- Whoever thought of this little feature is a genius. As small as the Cup Kozy is, it seems as if it’d be easy to leave it at home with your thermos, right? Especially for guys, who don’t have a purse to stash it in. 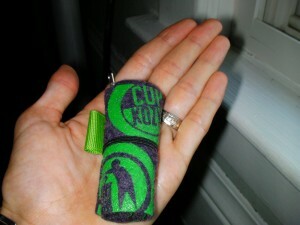 Well, Cup Kozy solved the problem by putting a little clasp on the sleeve so you can attach it to your keychain. I love this little product. It’s a great way for me to consume less when I happen to forget my thermos, and because it’s so small I never even notice that I have it on me. Cup Kozies are made from felt, and I’ve never gotten my fingers burned from my local brewery’s insanely hot coffee. My Cup Kozy does a great job insulating me from the heat. Right now, Cup Kozy is offering free shipping on all their products. So if you want one, go check them out! It’s a great little green product that I never leave home without anymore. I was wondering if I could send you some of our craft products to review as well as perhaps sending you some recycled \how to \ project that you could post on your blog. I found you through Best Green Blogs. I wanted to see if maybe we could do a contest jointly or maybe some cross advertsing- every little bit helps! Please feel free to take a look at my website, you can also link into our message board and gallery which showcases alot of our projects. Looking to purchase 300 cup kozy’s with 1 color imprint – This vendor does not respond to emails and no phone number. Can you email me their phone number.